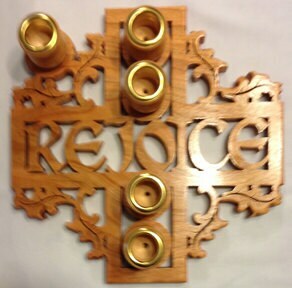 This beautiful, scroll sawed Advent wreath is made of ½” cherry with birch candle cups and brass cup rings. It is 10.4” in diameter and features the word Rejoice, which comes from the historic Introit for the 3rd Sunday in Advent: “Rejoice, and again I say rejoice…”. This wreath uses standard tapers (13/16" base). Normally ships in 3-5 business days. Beautiful craftsmanship, and it arrived quickly! I love our new advent wreath!